This was one of the most intense weeks of my life. After receiving an emergency IV drip at the end of just the first day, the event was no longer a race for me, but rather a matter of survival. I literally had to manage progress one step at a time. It is hard to imagine, but owing to the challenging terrain, blaring hot sun, injuries and fatigue, any forward motion required a completely concentrated and determined effort. My entire being was racked with various pains that came and went throughout the week. The IT bands were irritated and only worse from the start, though flat portions of the course were a relief relative to the murderous rocky ascents and descents. A left hamstring tendon that seemed to be pulling off the bone of my inner knee reminded me of every step I shouldn’t be taking and an axe splitting headache pounded me the first two and a half days. Imagine the worst hangover of your life and instead of abstaining from the drink, you have to keep downing shots of tequila. 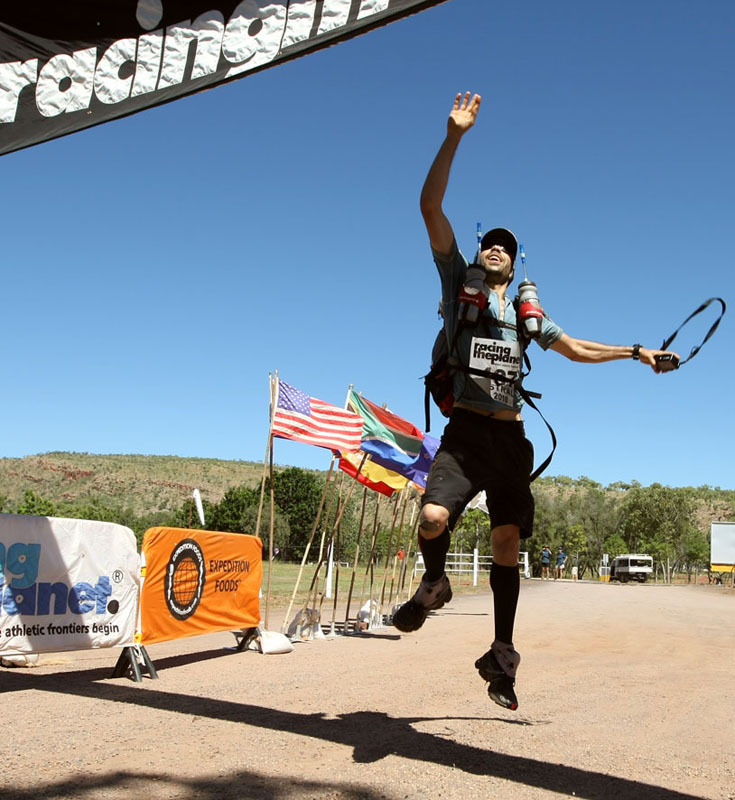 At some point during the race I realized that it was not my body, but rather my mind that was moving me through the outback. I was at once frightened and empowered to acknowledge that even though I was pushed beyond my physical limits I could still go further. At the same time, I was concerned that my will would be my undoing by pushing the body too far. I am not sure what the moral of the story is or will be. My cousin Ulla was a major inspiration for me. Knowing what she has had to deal with left me no option, but to push on. I am also grateful and aware of the positive influence of other runners on my efforts who at times offered sage advice or other times, saying nothing, coaxed me further as they too carried on with the impossible task. Then, PHEW. Unbelievably, about 10 am on May 2nd I saw the finish line in the distance. A last surge of energy flooded my body and I moved faster than at any other point during the week toward the final goal. Aching legs that could barely start, let alone finish each stage, somehow found the umph to leap for the finish line banner. My celebration lasted about five adrenalin filled minutes and then the aches and fatigue once again set in, but at least now I could try to heal myself as opposed to further aggravation. My body is recovering well, but I have yet to sleep without dreaming that I am pushing on through the outback in search of the next checkpoint or finish line.